With only two chemotherapy treatments left, I am so very excited to look forward to feeling like my old self again. I might not have been the fastest or the youngest or anything else great, but it will sure beat what I am feeling now and have for the past year or so! It was more than a year ago that I first began to get sick. It was horrible! It took seven months to figure out what was wrong with me. Once the enormous tumor was removed from my colon, I felt SOOOOO much better! Then, six weeks later, the chemotherapy began and I felt like crap all over again, only even worse. I have written many blogs about my journey, so I won’t go into detail again, but until they figured out just how allergic I was to the chemo and added steroids and other things to my treatments to help me cope, life was pretty much horrific. After five treatments, my liver values began to rise. After eight treatments, they were scary high. My oncologist took me off Oxaliplatin, explaining that was the culprit. I can’t say I was sad to see that crap go! It really made me sick. The 5 FU and the other drug (the name escapes my chemo brain) are bad enough, but that Oxaliplatin just sucked big time! It made me unable to withstand any cold at all on my hands, legs, face or in my mouth or throat. I had to wear gloves and a mask much of the time to keep the cold air at bay. About the only things the remaining two drugs do is make me weak and tired and my brain is often quite fuzzy. Unfortunately, without the Oxaliplatin, my appetite is back with a vengeance so I have put on weight. I really need to watch that because I have to lose another fifty pounds! One of the other side effects of the chemo is mood swings. I can be sad and tear up at sappy TV shows one minute, higher than a kite manic the next and madder than an irrational wet hen the next. It seems to depend on where I am in my chemo cycle as to how I react to things, but I am always weak and tired and I am REALLY sick and tired of that! There was a time when I could easily run two dogs in an all-day seminar and do so for days without ever missing a beat! Now I can barely take a shower without having to lie down on the bed for a few minutes afterwards to rest. Sir Cussalot knows to ignore me when I am in my madder than an irrational wet hen phase of chemo. He is so good. No matter what I say, he just goes about his business. The good thing is that I know I am being irrational and I know it is the chemo, so I can pretty much control my behavior and stifle my anger. I also know that my anger is not about anyone else, it is about me and my chemo brain. I can’t control what anyone else thinks, feels, does or says. I can only control myself and my reactions to others’ insensitivity or poor behavior. There are, however, a couple of people on this earth who test me to my limit. I would like to take a leash, wrap it around their neck and drag them to a high cliff and let them fall to their demise, but alas, I am too weak and tired to do so. The only recourse I have is to stay away from them and avoid conversations with them (electronic or in person). When I see these two people, I remove myself from their space so I don’t say something Sir Cussalot will regret. Just two more chemo treatments to go and I can get back to building up my stamina, my health and my good mood. About midnight, I woke up and couldn’t get back to sleep. I lay there listening to Sir Cussalot snore. 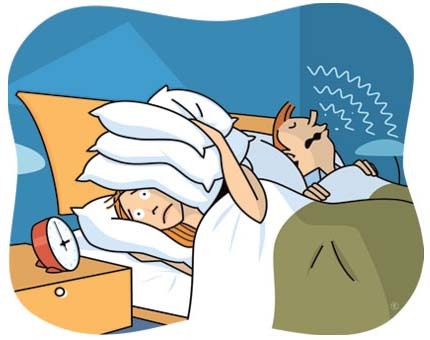 Now, he is convinced that he does not snore! One of these nights I am going to tape him with my phone to prove it to him! It must have been an hour or so before I could no longer take it. As I lay on my side of the bed contemplating my course of action, I got angrier and angrier. Yes, I am in that phase of chemo at the moment. We bought a couple of boxes of Breathe Right Strips to cut down on the snoring, but Sir C doesn’t like wearing them so I suffer. If he sleeps on his side, the snoring is not that bad, but when he is on his back it sounds like a freight train is bearing down on us! When I was at the end of my rope and could no longer take it, I moved my leg across the expansive king bed and past little MiniMe, who always sleeps under the covers. I finally reached Sir Cussalot’s hairy legs. I accidentally kicked him five or six times until the snoring ceased. As soon as he was quiet, I quickly removed my foot from his space so I didn’t implicate myself in the accidental kicking. He waits long enough so the turning over seems like HIS idea, then I hear the covers rustling as he maneuvers to his side. I say nothing but the seed has been planted. About ten silent minutes go by and I hear him get out of bed. He walks to the bathroom and switches on the light. The cabinet door opens and I know he is going in for the nose strip! HALLEFREAKINGLUJAH! Now I will be able to sleep! He crawls back in bed without a word. All is well again in the world. Is it done yet? I can’t remember how often you have to have these… I’m praying it’s done!! Thank goodness you’re lying down already when you accidentally kicked him four or five times! Thanks Eileen :). I love you too. If you try it, I know it will work but I also know that not everyone will be comfortable sleeping with something in their mouths. My husband isn’t even aware of it and it only took a night to acclimate to it. Thank you! 🙂 I am not sure Mel will wear anything like that. He is funny about such things. I know he will go nutz over the price for sure! Only two more! And you make me laugh. Thank you. -Ron I am so glad you are back online 🙂 Hope you are doing well.